Money Manager Ex is a free and open-source personal finance application which offers a number of tools to help people manage their personal finances including income and expenses. Personal finances on Excel spreadsheets can often become a tedious task and that's why more specialized tools like Money Manager Ex can be useful. 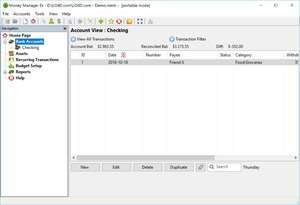 Money Manager Ex includes many useful tools inside of a user-friendly interface. With it, you can easily manage your bank accounts, monthly and one-time payments, all types of expenses and much more. For security reasons, you should also check out the Money Manager Ex download at LO4D.com which includes virus and malware tests. Additional screenshots of this application download may be available, too.